A strain of yeast originally used in the production of American whiskey. Produces low esters with a moderate amount of fusel alcohols. Used to ferment high gravity worts and worts made with corn as part of the base. White Labs, in their pursuit of bringing brewers multiple strains of yeast for different styles of brewing, now brings you American whiskey yeast! This yeast is suitable for high gravity fermentation. It tends to produce low esters and a moderate amount of fusel alcohols. A high alcohol tolerance makes it suitable for use in high gravity brewing of beers with corn as part of the base, as well as standard high-gravity styles. We include complimentary ice packs with ALL liquid yeast orders (if required), but cannot guarantee that the ice packs will stay cold during transit, and thus the yeast can potentially be exposed to hot temperatures. We highly recommend ordering dry yeast during the hot summer months or if you are ordering from a warmer climate. Many times during the winter an ice pack is not needed so we make the determination based on current temperatures and the destination! 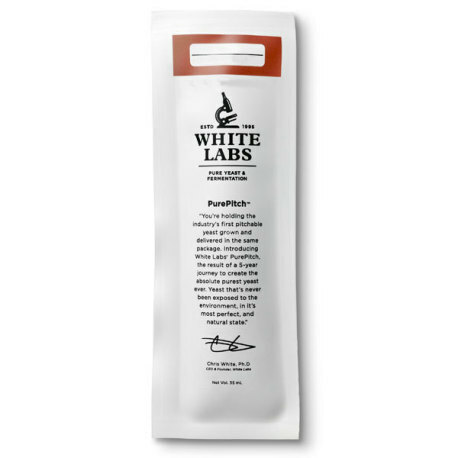 PurePitch Packaging utilizes a White Labs patent pending FLEXCELL process, which allows the yeast to be propagated and packaged in the exact same material, which means the yeast is never exposed to the environment! Click here for more info on the PurePitch advantages.